In the two states that surround us here in New York we are able to get a pretty decent amount of fresh vegetables. I was able to procure Shiitake mushrooms from New Jersey and Asparagus from Connecticut which was picked yesterday morning! 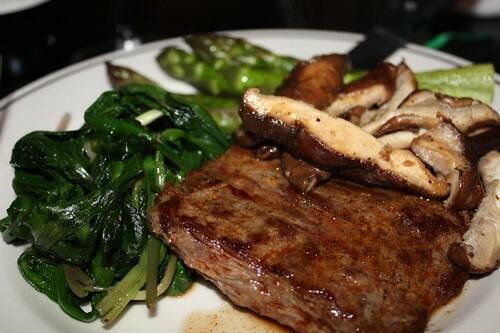 My laziness won over and I pan-seared some skirt steak to accompany the spring vegetables. In addition to the shiitakes and the asaparagus I also sauteed some ramps. All of the above were sauteed in olive oil and butter. All of the vegetables were incredible. I've never had such delicious shiitake mushrooms before. After Bon Jovi and Bruce Springsteen it's as if New Jersey finally got something right! Bravo! 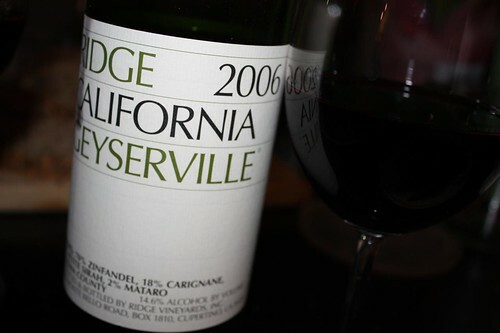 As an accompaniment I opened this bottle of 2006 Ridge. I found this back in January after looking for it for over a year. Sadly it was only after opening it that I read on the back that for best flavor it should be consumed in 2014. Oops. It was still pretty damn good though. For dessert we waded through a swarm of tweens to get some ice cream at Longford's Ice Cream. Jen had the mud pie and I had the Butterfinger blast (or some other nonsense name). Jen's father denounced this place as overpriced and terrible on his last visit to the neighborhood. We, however, after two trips have declared it fantastic. Unless you have no taste for annoying pre-teens, in which case you may want to steer clear of this establishment.